Citrus Blossom Water is the distilled water from the flowers of bitter or sour oranges, also known as Seville Oranges. This is used as an aromatizer in many Mediterranean desserts. You can make the blossom water with other citrus but the one with Seville oranges is the most fragrant. Living in a place full of citrus trees I like to make good use of everything produced on our trees, such as making marmalade, fruit preserve, liqueur and now citrus water. Making citrus blossom water was one of the first things I wanted to make when we moved to Asini with so many citrus trees not only in our garden but also around us. My mother used to make citrus blossom water, from Seville Oranges as well as rose water using an alembic still. One year, she must have been around 65 years old, she got on a chair to pick the blossoms and she fell and broke her leg. I’ve always wanted to buy a still but for the moment I can’t afford to buy one. May be, some time in the future. I recently learned the word “alembic” from my friend Anna on Facebook. When I posted a video after gathering the citrus flowers and said I was going to try to make some citrus water she said that her grandmother, who was also from Cyprus, used an alembic to make it. It was the first time I heard this word. I knew the word “still” and that was how I used it until now but when I mentioned the word “lambikos” which is the equivalent Cypriot word, she told me that the etymology of alembic and lambikos share linguistic history. Alembic əˈlɛmbɪk/ noun 1350-1400; Middle English, variant of alambic < dialectal Arabic al the anbīq still, < Medieval Latin alambicum, a loanword from < ancient Greek ámbix cup = άμβυξ. I continued searching the Greek word and found that in modern Greek άμβυκες, is still used today. However, the word lambikos only survived in the Cypriot dialect. I knew that you could make floral water using a pot but I didn’t know the exact method. I google searched to find instructions and found a site making perfumes who explained the procedure making other floral water. Making blossom water is not an easy job as you need a lot of time pick the petals one by one. However, if you don’t make any other use of the fruit, you can cut the flowers with some of the leafs and sit down and do it at your paste. To make the blossom water I used a pot with a lid. You have to put a glass bowl or a jar inside so that the water evaporating will fall into the bowl. The water boiling must be gentle so that the bowl will not “dance” inside the pot. I stopped the procedure after an hour to see how it is going but now that I know it needs around two hours to get around 500 ml of blossom water. If you are only going to use it in pastries, this will last for at least a year because a couple teaspons are more enough to flavour your desserts. If you just need floral water to wash your face then you will need more, so add a bigger jar inside, or empty the first one and continue boiling. The water is more than enough but the leftover was what I needed to make the fruit preserve. As all pots allow the steam to escape I thought of sealing the lid with an old traditional way my mother would seal the earthen pot to make Kleftiko. You mix flour and water to make a paste which seals the vessel. However, I was afraid I may ruin my pot so instead I used a paper adhesive tape and sealed it twice. After removing the tape I notice that there were residues of the glue on the lid. It wouldn’t go away with soap and water nor alcohol. My husband removed it with turpentine. I used 7 disposable ice cube bags, so make sure that you have enough ice cubes before you start the procedure. Next year, when we go to Athens and return back I hope to remember to bring along my pressure cooker with which I will try another method, hoping for better restults. 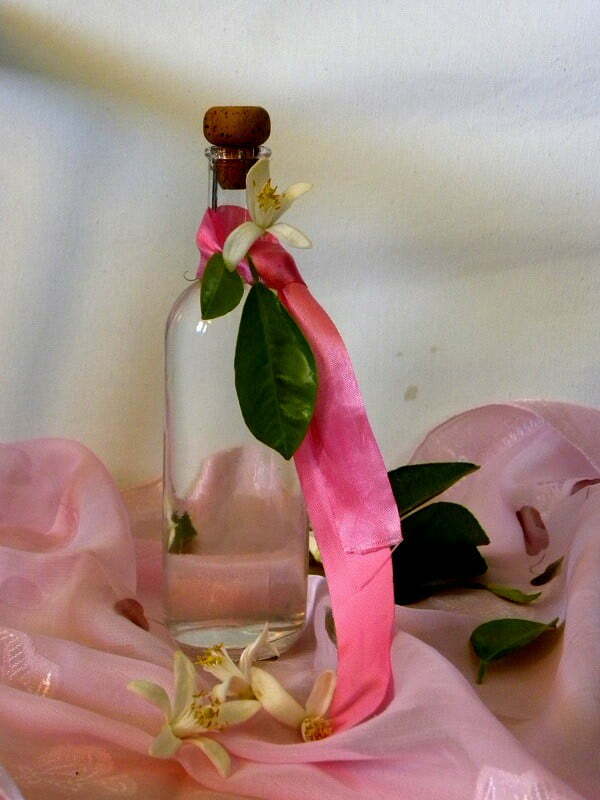 My next project is to make rose water. Yesterday my first two rose shrubs arrived (rose damascena and centifoil), which are the varieties you can make rose water and preserve and hope that by next year I will start making some. I have other projects in my mind as well but they will have to wait until I have time for them .. Pick the petals one by one and leave them outside for an hour for any bugs (usually ants) to go away. Wash them thoroughly and let them drain. Put a glass bowl or jar in the centre of the pot. Put the petals around it and add the water. Put the lid with the handle facing over the bowl and tape the lid on the pot twice so that steam will not escape from the sides. Get some ice cubes ready. Put the pot on the heat and wait for it to boil. Add some of the ice and reduce heat to a soft simmer. Put the remaining ice cubes back in the fridge. When the cubes melt, wipe the water with a sponge and add fresh ice cubes. The procedure is repeated about seven times so make sure to have enough ice cubes. Unseal the lid, remove the bowl and let it cool before bottling the citrus water. Do not discard the petals as in my next video I will show you how to make them into a fruit preserve. Wish I lived closer, so I could drop by and ask for some citrus blossoms from you! Look forward to your rose water!! I also wish we lived closer Angie. I would love to learn making your lovely breads!